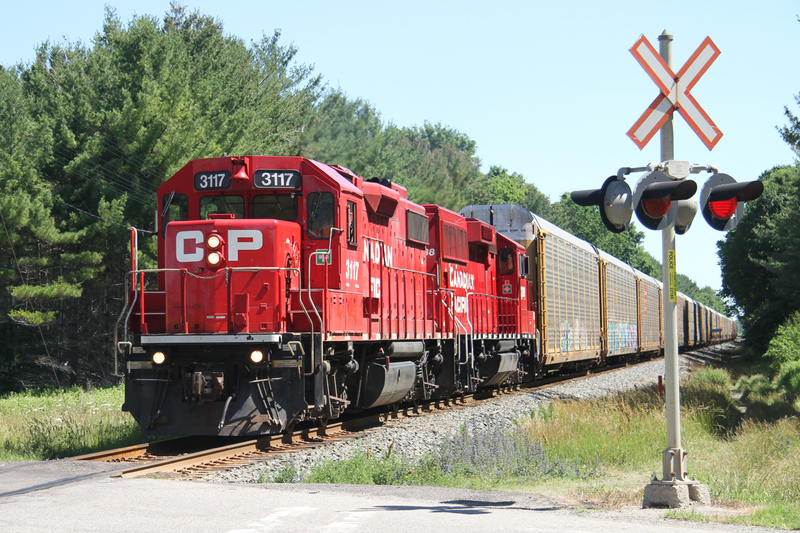 Railpictures.ca - Dave Burroughs Photo: CP 3117 is westbound with 20 cars for West Coke siding as it approaches Oxford Rd 4 near Innerkip. Station name sign PENDER one mile can be seen to the right of the crossbucks. | Railpictures.ca – Canadian Railway Photography – photographie ferroviaire Canadienne. Caption: CP 3117 is westbound with 20 cars for West Coke siding as it approaches Oxford Rd 4 near Innerkip. Station name sign PENDER one mile can be seen to the right of the crossbucks. Thanks, I tend to agree on the paint scheme. Not good on the big GE’s but quite acceptable on the 4-axle power, but only when clean. 50 plus years of taking rail photos and here is another dandy for the collection. I’m not big with this paint scheme on the GE’s, for me though, it looks darn good on the GP38′s and ECO20′s.